This pink-coloured Himalayan crystal salt has an ionized colloidal structure, making the 84 minerals and trace elements contained in the salt easily absorbed by the digestive system, and thus, nourishing to the cells. 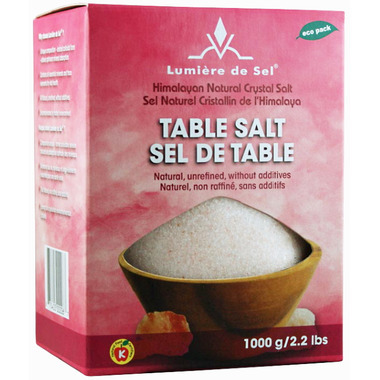 Bought the product as an experiment to try different types of salt to provide more balanced nourishment. Product is great. Himalayan Salt is so good!! The only kind I use regularly. A great product! Plenty of salt for the price, lasts a long time, came quickly and as advertised. The only salt I use. Really high quality and a little goes a long way. Love this salt and it comes in a great size! Very little needed to accent your food. Wonderful! Highly recommend! Excellent salt, which has become my favorite. All the right nutrition properties, great texture and flavor, and no downsides. Love this! The only salt we use and it tastes great and super healthy! A really high quality product at a good price. The only salt we use at home. Great salt and good price. Would highly recommend. Way better than table salt! Went through the small box so fast so I ordered the big one! Love it! I always use Himalayan salt now for seasoning food, good taste and price is good too. Nice salt. Good flavour and pretty colour. Wonderful price and a fantastic product. Full of minerals a body needs. If you're looking to add extra health benefits to your diet - get rid of the regular table salt and start using this. What makes Himalayan salt pink is the iron in it; iron is an aging substance the body needs little off, so my only concern with this product is the accelerated aging that will be caused to the body as a result of the additional amounts of iron (an aging substance). This is one of several reasons women tend to live longer than men (their body rids its self of excess iron each month for so many years of their life). This aside, it's a quality product that tastes good. It doesn't taste as salty as other salt, so one might find they use more of it to get the same flavour they are use to. In general, I have found that Lumiere de Sel produces a very good product and have been happy with all my purchases from that particular brand to date. Really love this product and don't have to use a lot in food. Plus it does not make one bloated. I use this salt for all my cooking, having replaced table salt completely. I am happy with the packaging and price. Perfect. Healthful. I know longer limit salt intake. Love that I can buy Himalayan salt at well.ca. This is great value for the price, plus it's so much better to use than regular table salt! I replaced table salt with healthy sea salt a couple of years ago, and stopped fearing salt, since this natural one is beneficial to us. This product is one of the most affordable ways to buy Himalayan salt. I try to used himalayan salt as I have heard it is the healthiest salt there is...this product I use with anything I ordinarily use regular salt with...thanks for selling it Well!